Methods of examination of patients with ENT pathology is constantly evolving, but a direct inspection of the larynx is still an important diagnostic technique. Autoscopia is a visual examination of the upper respiratory tract without the use of mirrors or other optical systems. If autoscopia the doctor uses only his sight, spatula or special spreaders that increase the area of inspection. Autoscopy represents the minimum study to assess the condition of the upper parts of the respiratory system. While doctor examines your eye directly, without the use of special optical and mirror systems. This becomes possible with wide enough clearance of the respiratory tract and the proximity of the larynx to the oral cavity. Infectious and non-infectious lesions of the larynx and trachea. Surround the formation of the said localization with suspected benign or malignant tumor growth. Changes of the mucous membrane of the larynx, as well as complaints of discomfort or pain. The need for biopsy or small surgical interventions on the tissues of the larynx and upper trachea. Patient age less than 5 years, as autoscopy associated with unpleasant sensations. Extensive pathological process in the oral cavity or larynx, impeding the inspection. In each situation the Clinician should assess the need for this diagnostic method, and if necessary choose alternative methods. Special preparation of the patient for inspection is not required. However, it is recommended to hold a conversation with the patient and explain to him the importance of the upcoming survey and the stages of its carrying out. This prevents excessive psychological stress. This is especially important when working with children of various ages. Food the patient does not require changes in the contrast, for example, diet after removal of polyps by colonoscopy, which distinguishes this method from endoscopic methods of research. The study is conducted in a health facility. The patient should sit opposite the light source, or the doctor may use a compact lamp mounted on his forehead. 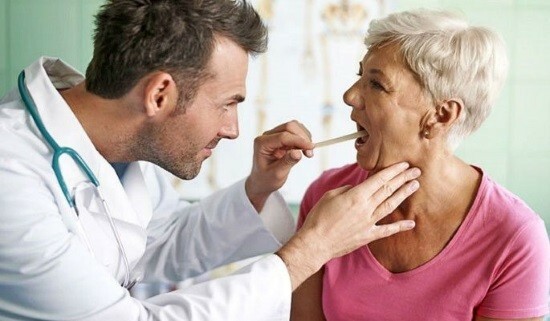 The patient opens his mouth, the doctor presses the back of the tongue, providing the best inspection. Throwing the head of the patient, the physician is able to directly examine the larynx and primary divisions of the trachea to the vocal cords. You do not need to use a special mirror or an endoscopic device. If necessary, can be performed a simple surgery associated with resection of polyps or stop minor bleeding of the mucosa. The additional possibility of autoscopia – biopsy with subsequent morphological analysis of the tissue, which helps to make a diagnosis in difficult situations. After the procedure is performed, the patient can immediately leave the medical facility in connection with the absence of procedures unwanted effects. Autoscope is an important method of examination of the upper respiratory system, which allows to survey even in a normal doctor’s office. Compliance technology research and psychological preparation of the patient, are important ways to prevent the development of complications.